It happens in an instant. You’re sitting at a traffic light and the next thing you know a tremendous force hits you from behind. Or perhaps you’re driving along the highway and a moment later your body lurches forward from the impact of a car that’s barreled into your rear bumper. According to the Insurance Information Institute, rear-end car accidents make up one-third of all car accidents in the United States. They are one of the most common types of car crashes. And they lead to the greatest percentage of injuries, compared to other collisions. The U.S. Department of Transportation reports that there were an estimated more than 7 million car crashes in 2016. Of those, 0.5% resulted in fatalities. Thirty percent resulted in injuries. But driver negligence is often a contributor to rear-end collisions. Distracted driving, aggressive driving and driving under the influence all play a role in these accidents that could have been avoided. If you’ve been in a rear-end collision, the Law Offices of Randolph Rice will speak to you free of charge and determine whether or not you have a valid claim. Our attorneys are experienced in getting clients the just compensation they deserve after a car accident. Call (410) 694-7291 to speak to counsel today. Rear-end collisions are usually not deadly. They can, though, cause a myriad of injuries. 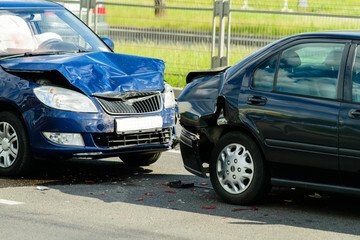 Whiplash, a soft tissue injury, is common in rear-end collisions. The jolt of being struck from behind causes your head to jerk. This can result in damage to the ligaments, muscles and other tissue in the neck. Concussion and other head injuries are also common. A concussion occurs when the brain and head move rapidly back and forth. Symptoms vary but can include difficulty thinking clearly, headache, mood changes and changes in sleep. Herniated discs are frequent as well. The trauma from the rear-end accident causes a disc in your spine to rupture. If the soft insides of the disc puts pressure on a nerve, a herniated disc can be quite painful. Other back injuries are common as well. Hand, wrist and shoulder injuries can occur when the force of the accident causes your arms and hands to hit the steering wheel. Your seat belt and air bag without a doubt may save your life in a rear-end accident. But they have been known to cause injuries. A seat belt may bruise the chest and neck area. An airbag deploys very quickly and may cause burns or broken bones depending on where it strikes your body. Don’t tailgate. Keep a safe distance between your car and the car in front of you. Most rear-end collisions happen when a driver is too close to the car in front of him or her. When that car breaks, the driver doesn’t have enough time to stop. In wet or icy conditions, allow even more room. Make sure your break and running lights are working and are clean. The car behind you relies on your lights to know that you are stopping. Check your mirrors. If a car behind you is tailgating, swallow your pride and try to move out of the way to let the driver pass. Always signal when changing lanes or turning. Break early and slowly. Coming to a sudden stop or breaking too hard at a red light, stop sign or intersection may not give the car behind you enough time to react. Check your tires for enough tread depth. Bald tires can cause you to skid. It may seem impossible, but try to stay calm. First, check yourself and other parties involved for injuries. Move your vehicle only if it is causing a hazard. If not, leave it is where it is until the police arrive. You may be feeling strong emotions, but try to be polite to all those you speak to. Do not apologize or admit fault for the accident. If there were witnesses, statements from them about what happened. Get their contact information as well. Get the names and badge numbers of any officers attending to the scene. Ask for a copy of the accident report. Seek medical attention. Even if you feel fine at the moment, some injuries from accidents do not present symptoms right away. If you do have medical bills in the future, it will be harder to recover those losses from the responsible party if you didn’t seek immediate medical care. Contact your insurance company. But do not be pressured into giving a signed or recorded statement before talking to your lawyer. At the Law Offices of Randolph Rice, we know how to work around common insurance company tactics such as denying claims, delaying payment and manipulating victims of car accidents. We offer a free consultation and you don’t pay unless we win. Call to make an appointment at (410) 694-7291.